50 • RV PRO • November 2018 rv-pro.com O P E N H O U S E C O V E R A G E ELKHART, Ind. 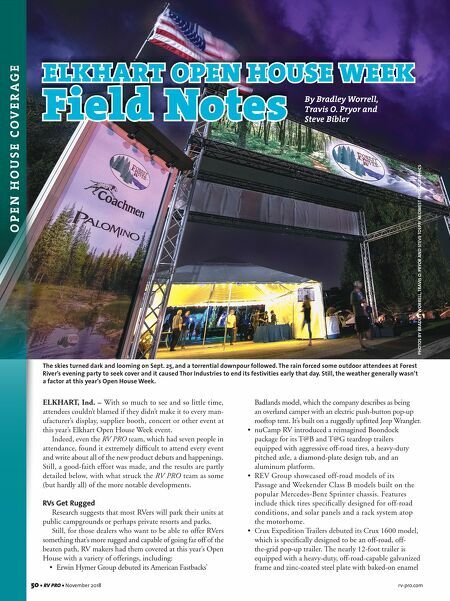 – With so much to see and so little time, attendees couldn't blamed if they didn't make it to every man- ufacturer's display, supplier booth, concert or other event at this year's Elkhart Open House Week event. 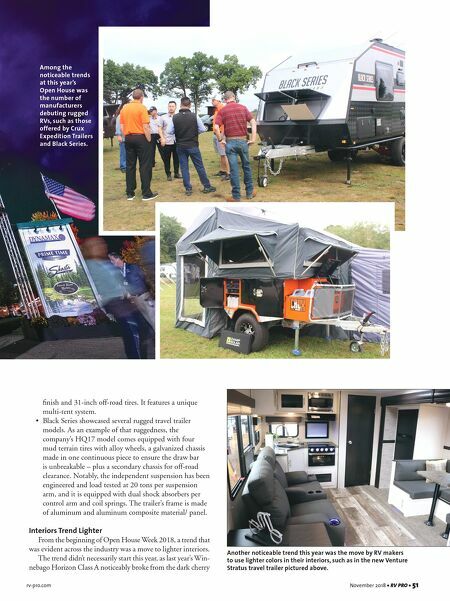 Indeed, even the RV PRO team, which had seven people in attendance, found it extremely difficult to attend every event and write about all of the new product debuts and happenings. Still, a good-faith effort was made, and the results are partly detailed below, with what struck the RV PRO team as some (but hardly all) of the more notable developments. RVs Get Rugged Research suggests that most RVers will park their units at public campgrounds or perhaps private resorts and parks. Still, for those dealers who want to be able to offer RVers something that's more rugged and capable of going far off of the beaten path, RV makers had them covered at this year's Open House with a variety of offerings, including: • Erwin Hymer Group debuted its American Fastbacks' Badlands model, which the company describes as being an overland camper with an electric push-button pop-up rooftop tent. It's built on a ruggedly upfitted Jeep Wrangler. • nuCamp RV introduced a reimagined Boondock package for its T@B and T@G teardrop trailers equipped with aggressive off-road tires, a heavy-duty pitched axle, a diamond-plate design tub, and an aluminum platform. • REV Group showcased off-road models of its Passage and Weekender Class B models built on the popular Mercedes-Benz Sprinter chassis. Features include thick tires specifically designed for off-road conditions, and solar panels and a rack system atop the motorhome. • Crux Expedition Trailers debuted its Crux 1600 model, which is specifically designed to be an off-road, off- the-grid pop-up trailer. The nearly 12-foot trailer is equipped with a heavy-duty, off-road-capable galvanized frame and zinc-coated steel plate with baked-on enamel ELKHART OPEN HOUSE WEEK Field Notes By Bradley Worrell, Travis O. Pryor and Steve Bibler PHOTOS BY BRADLEY WORRELL, TRAVIS O. PRYOR AND STEVE TOEPP/ MIDWEST PHOTOGRAPHICS The skies turned dark and looming on Sept. 25, and a torrential downpour followed. The rain forced some outdoor attendees at Forest River's evening party to seek cover and it caused Thor Industries to end its festivities early that day. Still, the weather generally wasn't a factor at this year's Open House Week.